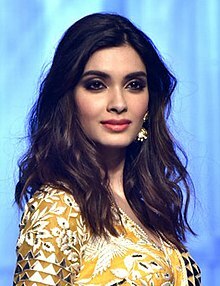 ↑ "Diana Penty". Fashion Model Directory. Retrieved 13 May 2017. ↑ Agrawal, Rati (27 April 2013). "Bollywood Celebs with Inter-Faith Parents". iDiva. Retrieved 13 May 2017. ↑ Jajoo, Amar A. (8 February 2013). "Bollywood actors who have good academic background". The Times of India. Retrieved 30 September 2013. ↑ Ajmera, Ankit (29 August 2012). "Diana Penty has a huge appetite for desserts". The Times of India. Retrieved 13 May 2017. ↑ Sharma, Viseshika (January 2013). "Flaming Blush". Verve (magazine). Retrieved 13 May 2017. ↑ Hari, Veena (21 September 2006). "These faces have made their mark". Rediff.com. Retrieved 13 May 2017. ↑ "Acting is more demanding, says Diana Penty". Hindustan Times. 30 January 2013. Retrieved 13 May 2017. ↑ "Debut Deck: Diana Penty". MSN. 11 July 2012. Retrieved 13 May 2017. ↑ ୯.୦ ୯.୧ Singh, Prashant (18 June 2009). "Indian sizzler for New York fashion runway". India Today. Retrieved 13 May 2017. ↑ "Indian model Diana Penty is new brand ambassador of Maybelline". BNO News. 12 December 2008. Retrieved 13 May 2017. ↑ "Diana replaces Deepika as a brand ambassador!". The Indian Express. 22 December 2008. Retrieved 13 May 2017. ↑ Singh, Prashant (9 July 2012). "Diana Penty quits ramp for Bollywood". Hindustan Times. Retrieved 13 May 2017. ↑ Prabhu, Vidya (21 August 2009). "Models in India are very impatient, says Diana Penty". Daily News and Analysis. Retrieved 13 May 2017. ↑ Saini, Minakshi (21 July 2012). "Rockstar was offered to me first: Diana Penty". Hindustan Times. Retrieved 13 May 2017. ↑ "Ranbir's girl goes to Saif". 6 April 2011. Retrieved 13 May 2017. ↑ Adarsh, Taran (13 July 2012). "Cocktail (2012) Review". Bollywood Hungama. Retrieved 13 May 2017. ↑ Sen, Raja (13 July 2012). "Review: Cocktail is let down by its inane plot". Rediff.com. Retrieved 13 May 2017. ↑ Chopra, Anupama (13 July 2012). "Anupama Chopra's review: Cocktail". Hindustan Times. Retrieved 13 May 2017. ↑ "Box Office Earnings 10/08/12 - 16/08/12". Box Office India. Archived from the original on 25 August 2012. Retrieved 13 May 2017. ↑ ୨୦.୦ ୨୦.୧ Upadhyay, Karishma (24 September 2016). "Diana is happy". The Telegraph. Retrieved 13 May 2017. ↑ Goswami, Parismita (19 August 2016). "'Happy Bhag Jayegi' review round-up: Here is what critics have to say about Abhay Deol and Diana Penty's film". International Business Times. Retrieved 13 May 2017. ↑ Bhatnagar, Rohit (19 August 2016). "Happy Bhag Jayegi movie review: A perfect family entertainer". Deccan Chronicle. Retrieved 13 May 2017. ↑ Vetticad, Anna M.M. (19 August 2016). "Happy Bhag Jayegi review: Diana Penty brims with potential; film is funny, but forgettable". Firstpost. Retrieved 13 May 2017. ↑ "Diana Penty to play an NGO worker in 'Lucknow Central'". Daily News and Analysis. 22 February 2017. Retrieved 13 May 2017. ↑ "Confirmed! Abhay Deol and Diana Penty's 'Happy Bhaag Jayegi' to have a sequel!". Daily News and Analysis. 15 February 2017. Retrieved 13 May 2017.